The Little House of Concrete Bookshelves: Andrea Camilleri "The Track of Sand"
Andrea Camilleri's on record as saying that he puts out a new Montalbano story every so often to appease the character and allow him to work on other projects, while there are some of us who'd prefer to have a new title every couple of weeks or so. While that frequency is a case of in your dreams the fact that I tend to fall on a new Montalbano and devour it in one or two sittings means I'd like to see new titles landing in the LHoC more often than they actually do, though I understand the reasons why that doesn't happen. A glance at the shelves suggests titles in the series are getting slimmer, which taken with that comment about appeasement might suggest that things are becoming formulaic or perfunctory, but as far as this reader is concerned when you're on a good thing you stick to it, and it'd be a shame to vary what amounts to a winning formula. As he approaches his 86th birthday Camilleri's long past spring chicken status, but as long as he's still with us and has Stephen Sartarelli doing the translations I'll be devouring whatever he comes up with in much the same way Salvo Montalbano devours platefuls of the usual mullets. Sure, there's a formula, but the point of the exercise at least as far as this reader is concerned is to sample the new offering to see what variation Camilleri has come up with this time, going back a while later for repeated exercises in picking over the bones. That formula involves the regulation quirky death, in this case an equine carcass on the beach outside Montalbano's house, an obvious explanation that fails to satisfy Montalbano (the horse was killed to provide meat for illegal immigrants) and the in character cameos from Montalbano's off-siders, acquaintances and bureaucratic sparring partners as the reality is uncovered. Those elements don't turn up in exactly the same way this time around (there's no spot for the friendly TV reporter or his less congenial counterpart on the other channel this time around) but they end up providing a comfortable framework that slips over the reader's (and, presumably, the author's) attention the way a comfortable jacket fits over the shoulders. In this case the horse has been bludgeoned to near death further along the beach and had fled as far as Montalbano's before the final collapse. Having found the dead animal, tracked back to the scene of the crime and called in his merry men to investigate the atrocity Montalbano places a call to City Hall to arrange for the carcass to be removed and spends half an hour drinking coffee in the kitchen with Fazio. By the time the municipal workers have arrived to dispose of the body it has disappeared. It's fairly obvious from the start that the disappearance is intended to ensure that the animal can't be identified, but that leaves the reason for the killing as a matter for investigation. It soon becomes obvious that the horse may have belonged to equestrian champion Rachele Esterman, who arrives at police headquarters to report one missing. She's in Sicily to ride in a charity ladies' race at the private hippodrome of local aristocrat Baron Piscopo di San Militello, is staying with Ingrid Sjostrom and has stabled her steed with horses belonging to local millionaire Saverio Lo Duca. Complications set in when we learn that a second horse has been stolen from the same stable, and it seems likely that the carcass has been removed to ensure no one can tell which horse is actually dead. When burglars repeatedly break into Montalbano's home it becomes obvious that someone's keeping the place under surveillance and is intent on sending Salvo a message. It's not, however, clear whether the message relates to the horse or to a forthcoming trial involving a Mafia suspect. That's probably as far as we can go wiith the detail without giving things away as far as the main plot line is concerned, but there are the usual array of set pieces and sidetracks to carry things along. Fazio gets to display his mania for detailed information, Mimi Augello is being kept awake at night by his infant son and Gallo continues to impersonate a Formula One driver at Monza. And Catarella continues to be Catarella, though he does manage to escape telephone duties at the station since his presence would work against the sting that Montalbano comes up with that may unlock the case. Predictably, food continues to occupy a key place in the narrative, though it's not always of the highest quality. When Ingrid drags him along to the races a main course of mullet that had been dead for a week provides Rachele with the opportunity go get Salvo out of his pants and there's the regulation guilt and attraction issues that threaten Montalbano's long standing relationship with Livia. 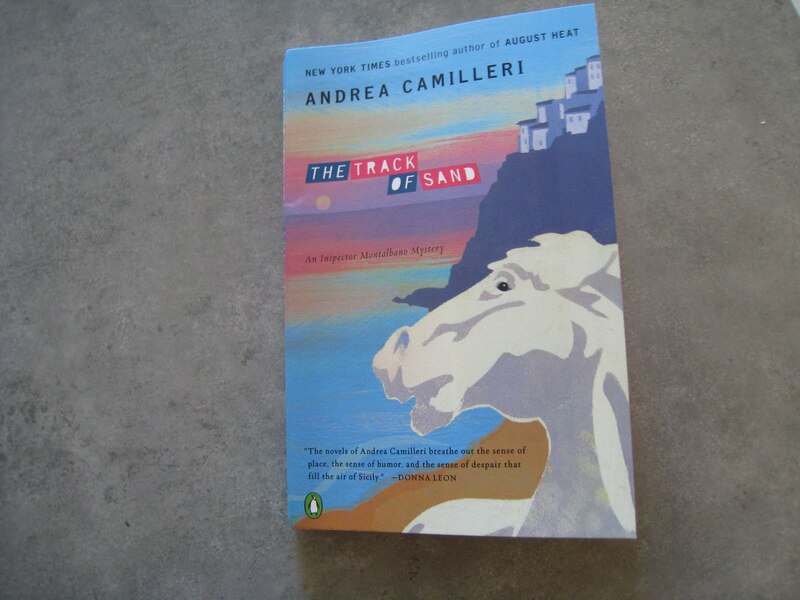 But, in the end, all the reader needs to know is that The Track of Sand is another Montalbano book with everything we've come to expect present though not quite correct as the plot twists and turns towards the eventual explanation.